This week the MAC features two prime time matchups, one in each division, while Saturday’s games also feature intriguing matchups. Meanwhile the MAC itself jumps the Big Ten to rank 4th in the conference power rankings. Not to mention the nation’s leading rusher (and he’s not a running back). Wednesday night 25th ranked Toledo hosts Ball State. The 3-2 Cardinals have been a bit of a surprise this year, beating Indiana and USF, and then taking Kent to the brink. They’ve also lost big to Northern Illinois and Clemson. They could make it interesting, but I don’t think Toledo will have much trouble. Of course that’s what I thought when they played Buffalo. This game is on ESPN2. Thursday night’s game is a big time East Division matchup, with Bowling Green travelling to Ohio U. Both teams come in at 4-1, Ohio’s loss came at the hands of Miami, which BG beat handily. 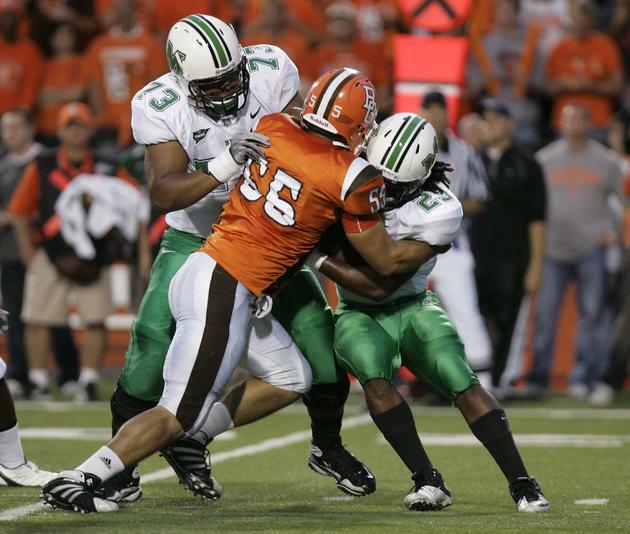 BG also looked stronger against Akron than Ohio. BG’s conference loss was to Toledo. Bowling Green’s defense ranks 9th in the nation (15 points per game), and their offense is balanced. Ohio has a strong ground game, with Beau Blankenship (1097 yards) and Ryan Boykin (6.5 yards per). Tyler Tettleton has 15 TD passes. Ohio’s D only gives up 22 ppg, although they have played an easier schedule than the Falcons have. Ohio is favored, and will be fighting hard to live up to the hype. Bowling Green is on a roll, and I think they will upset the mighty Bobcats at their house. This game will be televised on ESPN2. Another key East Division matchup has 5-0 Kent State travelling to 3-2 Miami. Kent is looking for its first ever national ranking; Miami is struggling to get back into the East Division running. And knocking off Kent is a great first step. This is Kent’s first real challenge in the conference. Miami handed Ohio U its first loss two weeks ago. Miami is a team that does it through the air. Kent State is a team that does it by forcing turnovers. They also have Dri Archer when they need a big play and Traiyon Durham when they need to eat up yards. Miami’s defense, well… Kent State goes 9-1, 6-0 this week. This 1:00 game is on ESPN3. Western Michigan travels to Buffalo, where the Bulls roam. Buffalo upset Miami last week, and came within a score of upsetting Toledo and Ohio. They’re not as bad as their 2-7 1-4 record shows. WMU was predicted to be in contention in the West, but have a killer schedule, losing to Toledo, Kent, NIU. They’ve also been banged up, losing their QB to a hand injury. So you could say this is a game between MAC underachievers. With home field advantage and coming off the win over the RedHawks, I’m taking Buffalo. Then we have two games that would determine who gets the first pick in next year’s draft, if there was one. But there isn’t, so this is a battle to prevent getting skunked in 2012. Then there’s 0-5 Eastern Michigan hosting 1-4 Central Michigan. What happens when a stoppable force meets a movable object? Find out here. Both teams have been fodder for the MAC heavyweights in MAC's scheduling this year.CMU upset Iowa earlier this year, and handled the Zips better than the big boys. EMU is at home. This is a tough one. But I’ll take the Iggles.